The USS Taylorholic Durant is considered to be the Flagship of the UFS Fleet. We are honoured to have Admiral Mike Calhoun as our former CO and as a current crew member, as well as other luminaries. We support UFSA as much as we can and we provide mentorship to the JOOP & CGSD graduate programs. We roleplay in-world on a drop-in and scheduled basis. We also add to our history and environment by writing RP Narratives, Mission Logs & Personal Stories for the UFS forum. 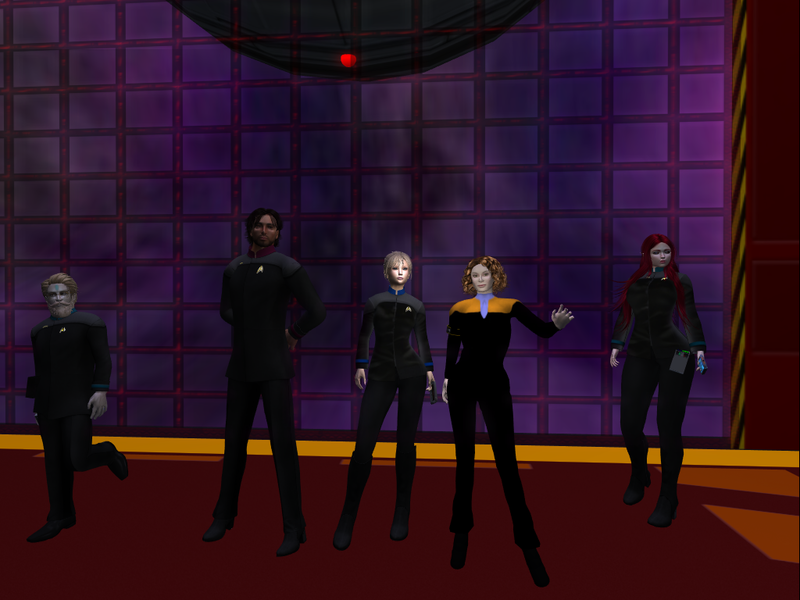 Inspired by the ship's namesake, the late Admiral Taylorholic Durant, crew members work to exemplify the behaviour, actions & vision of United Federation Starfleet in everything they do. Our first rule: to be kind to one another. And have fun. Please note we practice Post Order (P.O.) and One Post in our Roleplays. For further info, contact the C.O.! - faint outline of a planetoid has been seen on sensors. COMPOSITION: Duranium, tritanium, aluminum, nitrium and several unidentified elements. PURPOSE: As yet unknown. No visible signs of propulsion have been detected, leading to the supposition this is either a mine or a piece of space debris. However it seems to be in one piece. ENERGY READINGS: None at this time. LIGHT REFRACTION: None at this time. The object appears solid. CONCERN: In our examination of the object we used a sound wave amplifier to determine if it was emitting a signal of any kind. We at time index 180321.112 we detected a faint metallic sound that appears at regular intervals, like the 'tick, tock" of an old Terran clock. CONCLUSION: EXTREME CAUTION IS ADVISED. Science recommends removing this object from the ship without delay. While on the bridge, Jim Hode receives the report from Science. He frowns as he reads it. "This thing will be the death of me," he mumbles to himself, then rises from the Captain's chair. "Mr Sprout, I will be in shuttlebay one. You have the conn. Keep trying to raise the Away Team. Shields at max, that storm is almost upon us." He takes the turbo down to shuttle bay and steps out. Some crew are gathered there, examining the object. He nods to LT Spearsong, "Report." Vardasilver Spearsong: Captain, there have been indications of a metallic sounds from inside the object, could be construed as a ticking sound, we are here now trying to gather more information about the object in efforts to decipher whether or not there is more cause for concern. The storm is almost upon us as well, and all efforts to contact the way team so far have failed. Leninah "Sir just to add to that, as reported by Ens Torik the albeit lengthy science scans have revealed that there is a strange repetitive metallic like sound emanating from Barney. and the recommendation is Barney be removed from the ship as soon as possible." Doesn't even bother to explain anymore that Barney is the somewhat affectionate name she has assigned to the mysterious object in shuttle bay two. "This still leaves key questions such as how this came to be way out here in the delta quadrant, how it got close enough without detection to the Durant to 'attach' itself to the hull, and ticking or not what it's purpose is." Pauses for a moment to take a breath. "We have since run further scans which have just finished before I came down here to the shuttle bay so haven't been able to fully absorb however they show the presence of two other things that seem significant. a) The presence of tachyon particles and b) Dating of various molecules on the surface which are wide ranging in age. This leads to a hypothesis, that Barney hasn't just come through space. This would also explain how it managed to get so close without detection as well as the enormous distance it seems to have covered. Having read the reports from the away team to the space station it seems it may not be the only object to be somewhat out of place and time. I would like to run the same scans for tachyon and molecule dating on the other 'ancient Federation' objects Autre is in possession of at the earliest opportunity." Pauses again before almost stuttering to add "Oh yes ! one other thing, those tachyon particle counts are not static, they're increasing rapidly. If that ticking is a timer ?" Janet.gelbert draws a deep breath. "Sir, being in charge of the ship’s defense, including preventive measures, I recommend we beam it out of the Cargo Bay to a safe distance and monitor it from there. If it is a bomb and blows up we are then safe. We have enough worries about our shields holding while this storm is upon us." 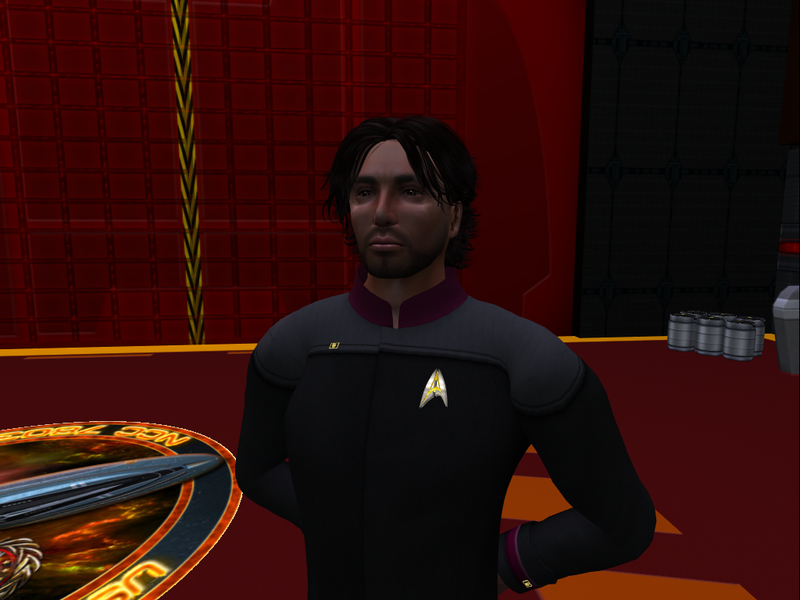 Rhys Careli Axel listens to the people talk, and looks over his readings on the tricorder to get some ideas of his own. 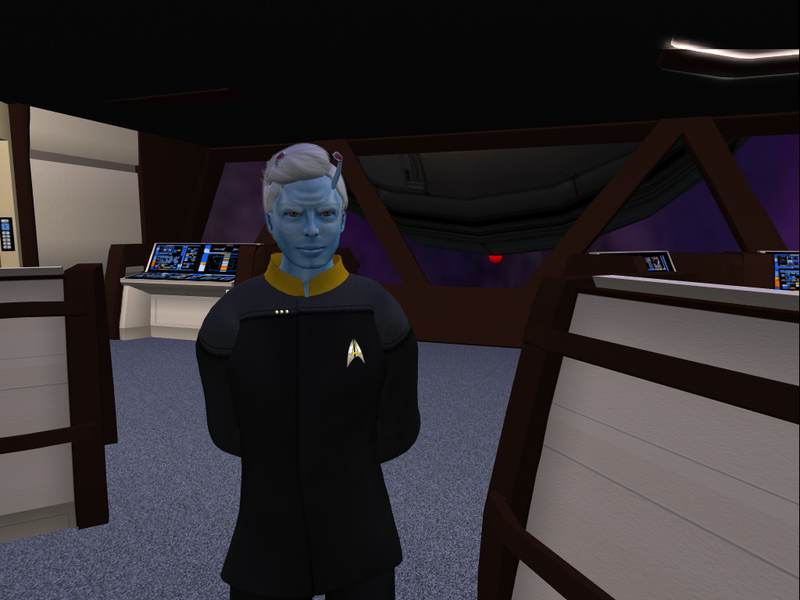 Jorden Allen walks into the shuttlebay operations centre, he'd been similarly ordered from the science officer to report to the shuttlebay, but he was already on this deck, and the operations centre was closer, so he figured he could oversee the emerging situation from up here. He walks over to the crewman on duty, and asks for a status report, to which Jorden replies '...Why do I get the feeling that this shuttlebay is going to require some significant maintenance soon?' He then walks over to the observation window, and looks down, observing the assembled officers. Hode listens quietly to each of the reports. "I was under the impression that transporters would not work in this area, especially considering the proximity of a plasma storm emitting an excess of electromagnetic energy. Can someone explain the significance of tachyon particles to me in respect of this object? You're saying this Autre unit might have been 'rescuing' objects for decades? And this is one?" 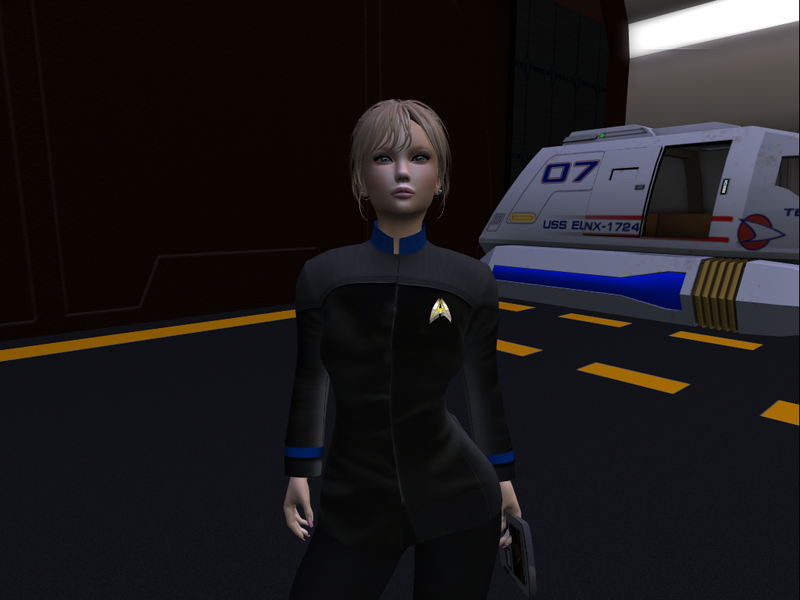 Spearsong): She has no answer for the captain on that question, but she is concerned about this object being in the shuttle bay for much longer, so she looks at the other officers a bit hoping someone had an answer. Leninah Takes another deep breath. "I'm still corroborating the evidence and to be honest I don't know if there will be enough to ever know for sure but It's entirely possible in my view anyway, that Barney is a time probe. Materializing and de-materializing in space-time at maybe random positions, or pre-determined, and collecting data from that point before moving on to the next one. It's unknown whether Autre is the source or however I doubt it personally. I would conject that the ticking is a timer to its next transition, rather than to an explosion, and that the increase in tachyon particles is it winding up for its next jump. If I recall we brought Barney on board manually via the shuttle, no transporters, I would suggest if we are to remove it from the ship we open the shuttle doors and give it a nudge gently out back into space and monitor what happens. I don't think we can or need to risk using the transporters on it, there are still too many unidentified elements in it and the last thing we want to do is make it blow up or take us on an unexpected journey along with it !" Gelbert runs her fingers through her hair. She feels responsible for the security of everyone. "If we cannot beam it out then I suggest we open the airlock and wave goodbye to it watching from a safe window!" Axel scratches his beard while walking closer to it: Has there been done a full body scan of it? Allen walks over to the nearby console, and opens up the report sent from the science officer, it was an intriguing read, with still some unidentified anomalies across the data. He opens up the communication relay between the operations deck and the bay itself, so he might hear what the assembled officers are discussing, overhearing some discussion about throwing it out of the airlock. 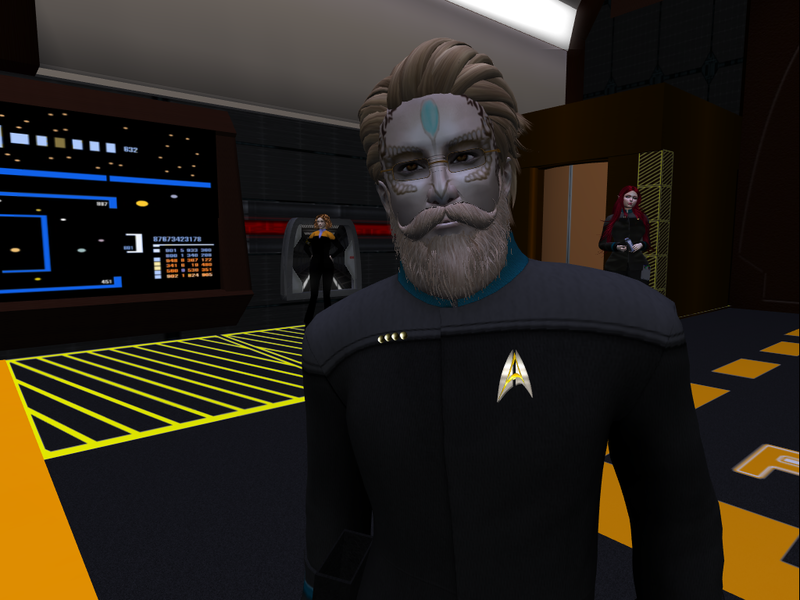 The unidentified elements perked the interest of the researcher in him, that had been somewhat dormant since his reassignment back to the Delta quadrant. It would be a shame to lose the opportunity to learn more about them. Hode: "A time probe. What kind of data would it have collected, Mr Leninah?" He moves closer, joining Rhys in standing just outside the forcefield, peering in. "Who would have deployed such an object, and why." He stood thoughtfully. 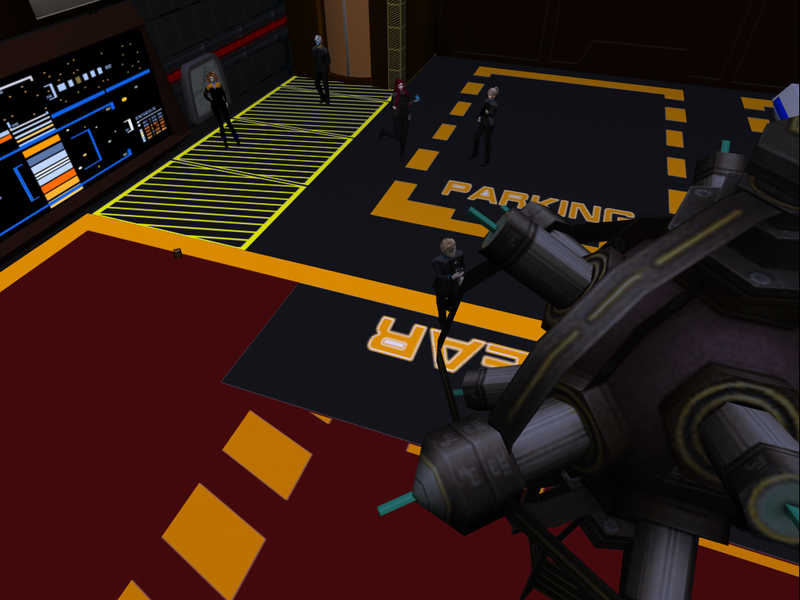 Spearsong: "In my opinion Captain, this does pose a threat to everyone on the ship if it is on some sort of timer. It could indeed be an bomb, or might not, I cannot heed the warnings, that is still could be and how many lives could be possibly lost if it is, I have to say I recommend we remove this item form the ship to a safe distance as Janet suggested earlier." She steps forward when she says this and when she is done she tugs a bit on her collar feeling a bit intimidated by the captain. Leninah watches nervously as Mr Axel approaches Barney "Please don't hit it with a hammer Mr Axel ?. I agree with Mr Allen I would dearly love to investigate all of those intriguing elements, however, Barney appears to be counting down to something and whether explosion or time jump I don't think we can afford to be near it when it gets to zero !" Looks to the Captain "Can you imagine the value of data taken from ships or technology from the future or other species way out of our normal reach? I would love to be able to get at the data is already has amassed !" Gelbert) tries to remain calm as she cannot understand why people are arguing and discussing when there could well be a bomb on board. She feels frustrated that crew members are not taking the risk side very seriously. "Sir we do not know that it is not a bomb! I urge caution!" Axel looks at it and back at his tricorder "For me it sounds like it is just out looking, very much like a old fashion android lifeform of a kind. How can you be sure it is a bomb and not just curious which might be why it gives off the sounds?" Looks at it curiously with a tilted head. Allen listens to the discussion, the tension induced by the ship traveling in the expanse already for so long had been manifesting also in his engineering personnel, and doubtless the rest of the crew. Somehow a device that had yet to show any sign of being volatile, or hostile in nature, was assumed to be a mine, or a bomb. If it was volatile, why hadn't it taken half of the nacelle with it when it came into contact? Hode shook his head slowly. There were a thousand possibilities here. He was in charge of the safety of the crew, and the ship. But they were also tasked with exploring the strange and the new. He said softly, "It's rather easy to be alarmed and look at this object as something dangerous because it is unknown. I'm chockablock with ideas about what it could be. If it's been gallivanting around the quadrant and has gathered intelligence from different places... and times... well, wouldn't it be incumbent upon us to try to access that data?" He nods to Leninah and then swivels his head to Data with a surprised look. "You're stating this might BE a lifeform?" He raises his head, looking up at the mass of the thing. "Are you... are you suggesting it... " He needs a moment to consider the possibility. Spearsong just shakes her head, she could see where they were coming from, but it was an awful big risk to take just to be curious. "Well, please consider the possibilities, it could be dangerous, not alive but stuck on some sort of timer when it came into contact with our ship, could have triggered it and woken this giant from its slumber." Leninah "This is a tough call and one predominantly of risk. On the one hand the potential for fantastic invaluable knowledge, and on the other ... BANG !.. all gone ! This has to be a command decision Sir. If you want us to ditch Barney we can do so by opening the doors now. If not we do need to get it somewhere safer off the ship and out of blast range just in case, though I have no idea what range that would need to be ! In my opinion, and I just know I'm going to hate myself in the morning for saying this and I will hate explaining myself to Reiko, but I agree with Mr Varda, I don't think we can afford such a risk no matter what the rewards?" Gelbert checks with Internal Security that they are armed and ready for dispatch if this item does turn out to be an old fashioned android life form of an aggressive kind. It pays to be ready rather than being caught unawares. It could come from anywhere and be hostile once time is up. "Sir, it could be monitoring us, it could be wondering who we are and what our intentions are." Axel looks at the Captain "Well, Data is considered a lifeform. He is far more sophisticated and got a speech pattern aligned. And the sounds from it does not sound as if on a countdown" looks down at his tricorder to see if he can see a pattern in the sounds it gives. Hode: "If there is even the slightest chance this is a lifeform we must investigate further, but be prepared to remove the object if there is any further threat." To Rhys he says, "Is the ticking any sort of pattern?" He looks to Leninah, "If we dropped the forcefield, what effect would those tachyon particles have on Durant." Spearsong hears the captains suggestions but stays silent this time, she didn't want a confrontation,especially not now as nervous as she was. Her throat felt dry just standing next to this thing, and all her senses were alert and ware more so than before. She looked to Leninah who was standing next to her and gave her a look briefly one made from fear and concern. Leninah turns to Doctor Axel "I'm not advocating we kill it if it is a life-form, just get it back to where it came from, safely. If it is a life-form, stays around and doesn't blow us up we can monitor it from a safe distance. Or if we need to be closer to it, a shuttle can be deployed to be closer at least mitigating the risk to a shuttle craft and one or two crew as opposed to the whole ship and complement." Looks to answer the captain's specific question. "Unless it triggers something the stream of tachyon particles won't do us any more damage than they did when we brought it on board Sir. We could however extend the forcefield to cover its departure and lower it when its off the ship, as an alternative"
Gelbert wipes away a bead of perspiration as she calculates the proximity of the storm and feels compelled to speak up. "Sir, with the storm almost upon us I do not recommend opening the airlock at this proximity to us, or dropping the forcefield. " Axel studies the ticking sound closely "Easiest way to explain would be to say, see it as a human. It got a steady heartbeat but with the tick force of a stressed person considering it being stuck in a forcefield. And I see no problem sending it back out if we are sure it can not be harmed by the way we do it. But are we not to explore new things while out here?" looks at the Captain with a raised eyebrow with the question . Hode nods to Gelbert, "Excellent point there, Commander. We cannot open the shuttle bay doors to either push the thing out or tow it with a shuttle." His brow furrows. He thought by coming down and talking to the crew he would have more information to make an informed decision, but instead, he feels more confused. Especially with Allen's remarks, which all make sense as well. "Is it possible our forcefield is somehow.. restricting it? Causing it harm? Maybe the energy used in our tractor beam and forcefield are... have... affected it in some way?" He says to Rhys, "When you say this is possibly a lifeform, do you mean this entire... thing," he gestures, "is 'alive' or do you mean there is a life form encased within it? Spearsong listens and then turns to Janet how much time do we have till the storm is on us? She is weighing which would be better ride it out with this thing inside the ship ticking away that could be a possible life form hostile or not or possibly a triggered mine or bomb of some sort, all for the safety of the crew first which was most important to her. Leninah nods in agreement with tactical's concerns over the proximity of the storm. "I'm not sure its a safe assumption that because we can't detect it's scanning that it isn't scanning us Mr Allen. There are elements in it we don't even recognize. If it is alive it will only come to harm if it detonates not because of what we're doing to it. Whatever we're going to do we need to do it now while we still have a window before that storm reaches us Sir"
Gelbert bites lip. "The storm is right here... we're already feeling the effects... "
Axel: Considering the sounds, I would say it is alive. Just paralyzed by the forcefield. A life form within it sounds illogical considering size and shape. I would say lower the forcefield on it, if it is a bomb the ticks should become more rapid or it would give more motion to activity, and we could then eject it into the storm. And if nothing happens we pick up pace to get away from the storm with it so we got more time to study it. Allen looks back to the device 'Well, the forcefield we're using is on the highest setting we have available to us for sustained use.' He receives a chirp on his combadge, then replies 'Report.'. A voice comes on, announcing a problem with the bussard collectors, and the deuterium reserve. He looks to Hode 'If you don't mind Captain, this sounded urgent.' Without waiting for the nod, he then walks towards the turbolift, and goes to attend to the new emergent situation. Hode feels unaccountably cold. Maybe it was all the metal around him, or the various points of view being shared with him, or the thought they might have harmed some unknown lifeform... he shivers. He'd been having odd dreams when he could sleep. And he, along with most of the crew, have been up all night. Red alert means everyone is at their post. He makes a mental note to have the Acting XO draw up watches... no point in them all getting exhausted. Despite all the overwhelming concerns he faces, he stifles a yawn. He nods to Rhys. He was learning the CMO was a wise man. He taps his combadge, "Hode to Sprout. Set course away from the storm, full impulse. Say when we are fifty thousand kilometers distant." He turns to the others, "Following the good doctor's thought, it will take a few minutes to move the ship far enough away from the storm that we can open the shuttle bay doors. I suggest, once the ship is in position, that we take a shuttle right outside the doors and be prepared to lock a tractor beam on Barney. We can then drop the forcefield and remove it immediately if there is any change. Spearsong is relieved to hear this and agrees with the captains orders on several counts. "I guess Barney will be riding along behind us?" Leninah Looks quizzically at the Captain Clear signs of restraint written all over her expression as she limited her response to an "Aye Sir". It wasn't that she didn't trust or respect him, or didn't appreciate the gravity of the decision before him, just that 'gung ho lets hit it with a hammer and see what happens' approach demonstrated by both the captain and the security officer recently was now replaced by this cautionary process had caught her somewhat by pleasant surprise, but was confusing nonetheless in getting to know her new CO"
Gelbert feels relieved that the item is being removed from the shuttle bay....finally. Axel likes the idea he hears the Captain says and looks at the thing in front of him. =^= Hode here. Turn the ship to beam - facing the direction we came. We will be launching a shuttle. Stationkeeping. =^= He looks to Janet, "You and Ensign Leninah, take the shuttle out, set up to lock a tractor beam on my mark. Mr Spearsong, maintain a close watch on any change to the... Barney. Mr Axel, prepare to drop the forcefield." 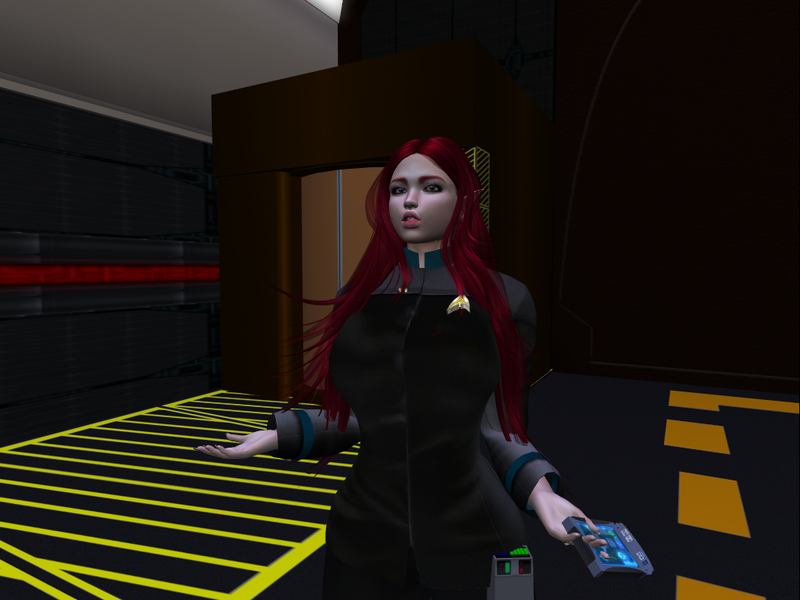 Leninah: "Aye Sir" moves at some speed towards the shuttle bay, checking her PADD is present and has the instructions for what to do in a shuttle ! Gelbert: "Aye Sir" Janet walks swiftly to the Tesla and nods at Leninah. Axel nods to the captain "Aye, Captain." Walks over to the console to get ready. Hode waits and watches as the two assigned officers board the shuttle and prepare to lift off. 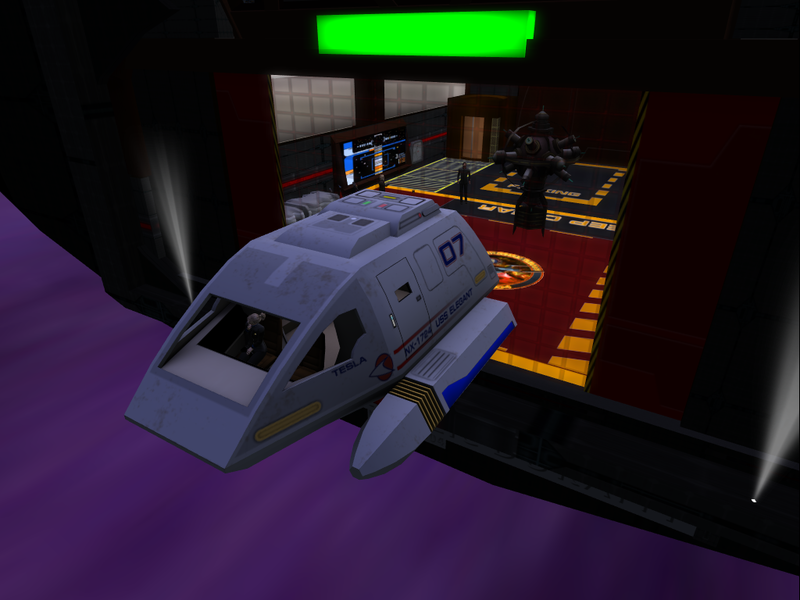 "Open shuttle bay doors," he barks to PO Shilova. "Once they are in position, Dr Axel, we will drop the forcefield and you will monitor any changes to the .. object. If there is even one whiff of danger you will inform me immediately." He looks to Varda, seeing the concern on her face, "Steady on," he says, gently. Leninah starts up the engines after running pre-flight checks. "Ready to dis-embark Captain !" Axel looks over at the captain ready to lower the forcefield while holding his tricorder in the other hand. "Ready when you are, Captain". Hode watches until the shuttle has cleared the bay. He knows Sprout understands what to do. Aft shields have been dropped. Shuttle bay doors are open, airlock forcefields are holding. He takes a deep breath, "Shuttle, lock on to Barney and prepare to initiate a tractor beam on my mark." He glances to Varda, "start your monitoring, and then looks to Rhys: "Drop the forcefield on the.. object." He can't help but step back, and look up. 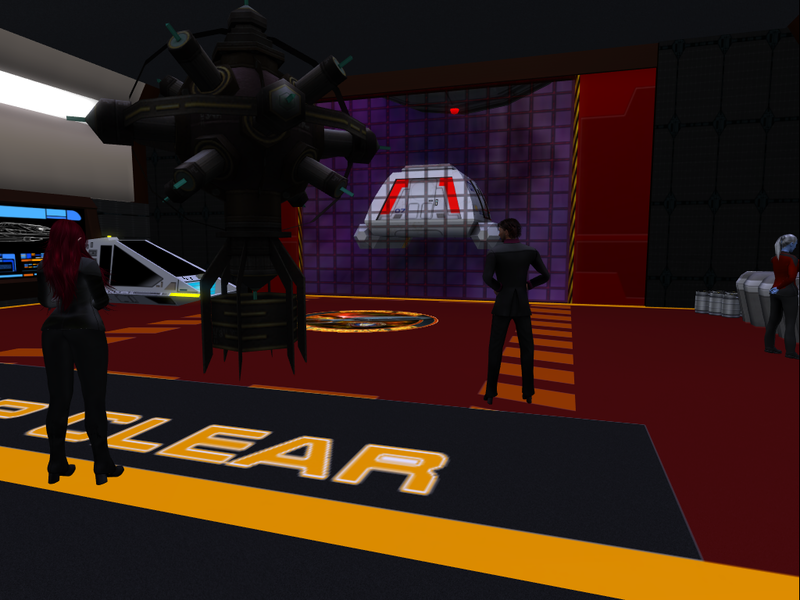 Spearsong looks up at the object giving it a view from all angles as it starts and says "aye captain"
Leninah runs another scan of Barney from the shuttle's scanners as the craft clears the bay doors "Urmmm Captain, I don't want to worry anyone but what Mr Axel said before about the ticking not increasing ? Well .... gulps ... it is now, its getting faster by quite a bit too ! Can we hurry this up a bit maybe ?" Locks the tractor beam onto Barney "Target locked Sir"
Gelbert wishes her knees would stop shaking. She is feeling very tense and second checks all manoeuvres. " Aye"
Axel looks at his tricorder and the readings after lowering the forcefield. Leninah "Shuttle standing by Captain, ready to pull on your command"
Janet (janet.gelbert) checks all readings "Standing by". Axel starts returning the ticks and checks if it changes in return. Hode is glad that the ship has moved away from the plasma storm. Somehow they seem to affect him. He recalls his... flashback in shuttle ops just yesterday. He swallows and tries to focus on the moment at hand. Where he felt cold just a couple of minutes ago, he suddenly feels hot. He raises a hand to loosen his collar. Is it just his imagination or are those clicks... inside his head? He unaccountably wants to sing 'Rule Britannia' but swallows again. But then an idea comes to him. "Mr Axel. What if... what if it's playing a rhythm? A form of.. music??" Leninah whispers to Janet "I do hope Barney isn't repeating the same message 'can I go now ?' and Data hasn't just replied 'sure go now take us with you!'" Looks out of the window at the inspiring sight of free space and feels so small. Smiles at Janet "Do you think they're expecting a concert now ?" Just to try and lighten the understandably tense mood. Gelbert remains as focused as she can and checks all readings that the shuttle is not being affected in any way by either the item or the expanse. She is awestruck by the views and thinks that it has been too long since she piloted a shuttle. She has heard the suggestion that music might be the communication medium . She turns to Leninah and whispers back wondering why they are whispering "I do hope so too". Axel tilts his head "That could be..." stands still and listens "could be their way of communicating I would think. We got any good songs to repay it with?" Hode begins to sing in a warbly tenor, "Land of hope and glory, mother of the free...." He looks up at Barney... and notices it has begun to glow. "Look!" 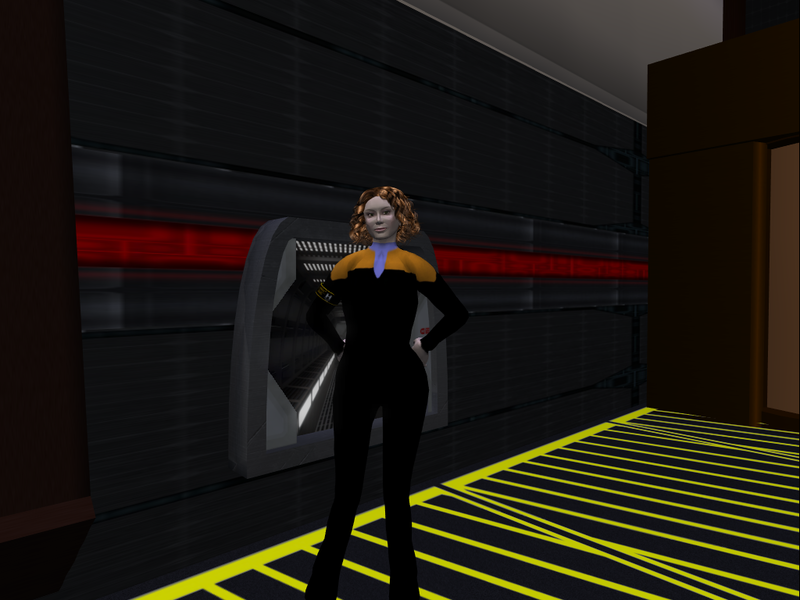 We were in the shuttle bay going over the item, we got to find out what it is, as I worry for the health of the crew. For some strange reason the other members thought it was a bomb, but from what I hear of the sounds that it gives off. It might be a sentient being of some kind. Perhaps the metallic sounds it gives could be the heartbeat. Trying to discuss reason with the fellow crew members and Capt. Hode is not easy but I do not give up that easily. As I see it, it is a life form itself. Just paralyzed by the forcefield around it. The Captain agreed to get us more out of the way of the storm, and open the bay doors as a precaution to make sure if anything goes wrong we are safe. When we lowered the forcefield we found out that it might be communicating by music, and for some strange reason Capt. Hode started singing a British song from the old days. What a weird weird guy. Captain Rhys Careli Axel M.D.